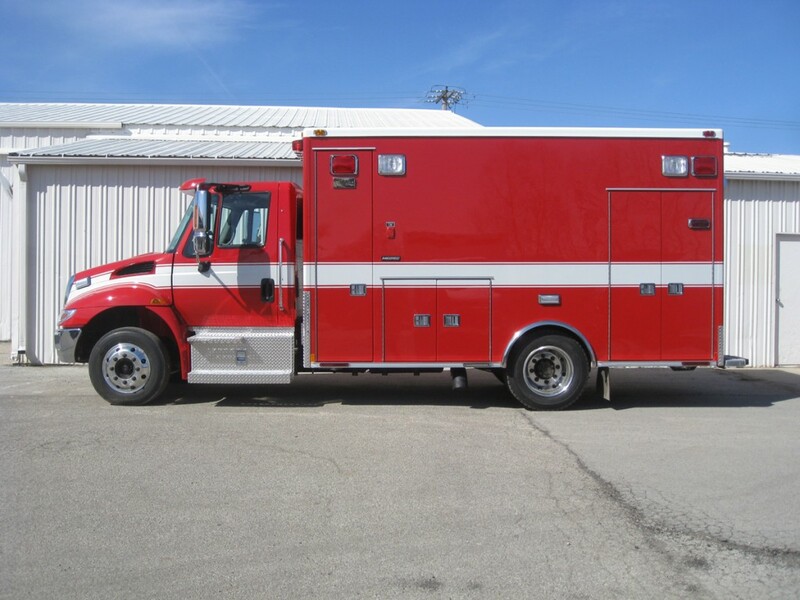 For those interested in ambulances, Medtec has delivered several area units in 2010. One mentioned in an earlier post and photographed by Karl Klotz went to the Troy FPD, which can be seen HERE. Others include LaGrange Park, Elmwood Park, and a pair of units to South Holland. Another post will be forthcoming which highlights the dozen or so 2009 deliveries, several of which have been photographed and posted already on this site. 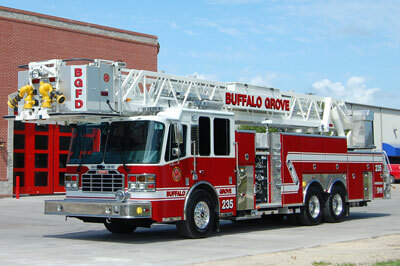 The Buffalo Grove Fire Department received their new engine and tower ladder directly from the FDIC in Indianapolis. 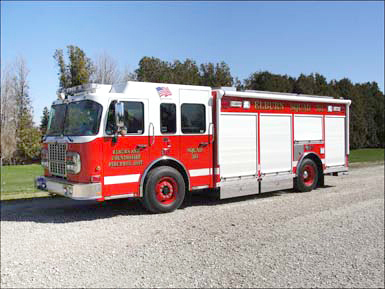 The Ferrara units were originally stock trucks that Buffalo Grove was able to purchase before they were built. The engine was built to the same specifications as Buffalo Grove’s 2007 KME Predator engine (218) so that the bodies match identically (or very close). 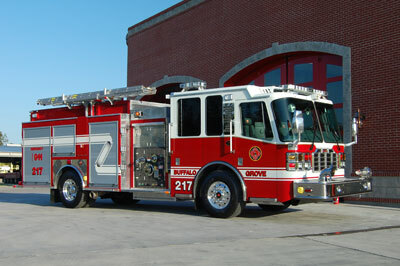 Buffalo Grove does not letter their apparatus with company designations, they only have the fleet unit number as part of the graphics. 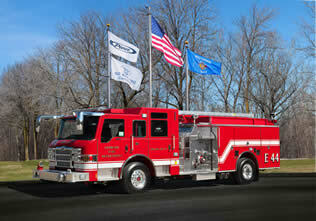 The Rolling Meadows Fire Department has had plans for some time to build a third fire station. Financial shortfalls with regards to the municipal budget are nothing unique to Rolling Meadows and the village board has cast doubt on the feasability of obtaining the new station. Recently they had voted against alloting the funds for an environmental assesment of the land. An article in today’s Daily Herald tells the story of a reversal of this past decision. Reversing a March vote, the Rolling Meadows City Council has approved a resolution to move forward on an environmental assessment of the land planned for a controversial third fire station. The assessment is required if the station is to be built with state and federal grant money. The assessment, at a cost of $20,000, was approved by a vote of 4 to 2 Tuesday night. Ward 1 Alderman John Pitzaferro and 4th Ward Alderman Brad Judd voted against the measure. In March, the council rejected by a vote of 5 to 2 a proposal for an assessment from Burke Engineering of Rosemont that was priced at $29,000. Burke Engineering agreed to bring the cost down to $20,000 to win approval. Rolling Meadows was awarded an Assistance to Firefighters Grant from FEMA worth $1.157 million for the construction of the new station, which would cover about half of the costs. The city also has an additional $100,000 from a state grant. From the awarding of the grant in October, the city has a 36-month window to complete the station or it will lose the grant. Mike Cannon, a resident of Rolling Meadows, brought up a petition signed by 102 residents to delay building the third fire station until the city is more fiscally sound. “We can’t keep spending money we don’t have,” said Cannon. 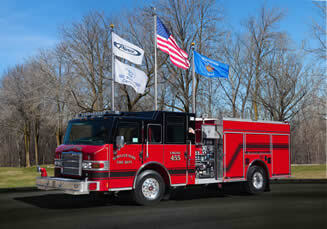 Judd said that “90 percent of his residents” did not want to spend money they did not have to build the fire station. Judd compared it to buying a Mercedes just because it was 40 percent off, even if you didn’t have the money for it. “To me, $20,000 is too big of a gamble for something we might not even build,” said Pitzaferro. 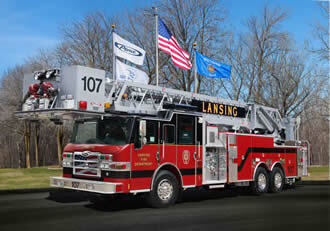 The fire station would improve response times for residents and businesses in southern Rolling Meadows. Mayor Kenneth Nelson said that some equipment would be relocated to serve the area better. 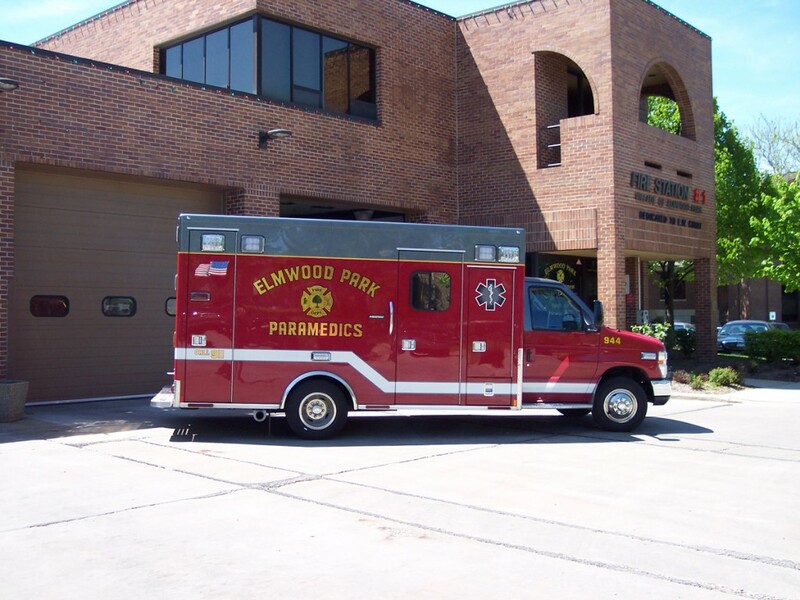 The Streamwood Fire Department recently made a decision to close one of their three stations. The station on Park Boulevard was closed and the personnel was redistributed to the other two stations without reducing the daily manpower. An article printed in the Daily Herald on April 20, 2010 can be viewed HERE. Today’s Daily Herald has an article which talks about the local residents planning to protest the closing. The article is HERE. Residents frustrated with what they called the abrupt closing of a Streamwood fire station will rally on Saturday and Sunday. Rally organizer Matthew Dobson said he wished village officials gave residents more notice when they closed the fire station on Park Boulevard earlier this month. “I was shocked, because I would have thought they would have told residents more,” he said. Dobson feels the area around the shuttered station, which will continue to host departmental training, is underserved and that response times to emergencies would increase. He started a Facebook page to keep the station open and it has received more than 900 supporters. The rallys will be from 9 a.m. to 2 p.m., he said. Village Manager Gary O’Rourke said the moves actually make the department more efficient. “We do not believe we have diminished the ability to respond to the safety needs of our residents; in fact we believe we are providing a better response,” O’Rourke said. 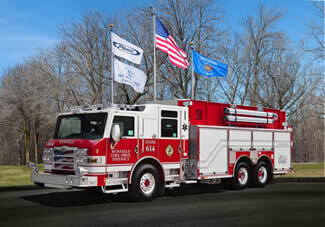 Village officials closed the station on April 1 and reassigned the firefighters to the village’s other two stations. The move allows the department to add a member aboard fire engines crews, going from two to three. Three-member crews don’t have to wait for backup before entering a burning building, while two-member crews had to wait for additional units. Dobson lauded the three-member crews and said it increases safety for firefighters. He wished the village could both staff three-member crews and reopen the station. Deputy Fire Chief Mark Hudson said that’s not possible with the 49 firefighters currently employed. O’Rourke said the village would review how the new staffing plan worked. He also stressed that, contrary to recent comments from residents, the village hasn’t laid off firefighters. “I think the key component to all of this is the professional fire command team reviewed this operation and recommended this to more effectively response to the public safety needs of the residents of Streamwood,” he said. However, Trustee Jason Speer echoed Dobson’s concerns about how quickly officials closed the station. He said it was briefly mentioned at a March board meeting. “There was no warning, no board input on the closing,” he said. O’Rourke said the matter was discussed at budget workshops. He added that the village acted appropriately. “There are many things that happen every day that we don’t provide notice for; we’re certainly not trying to hide anything,” he said. 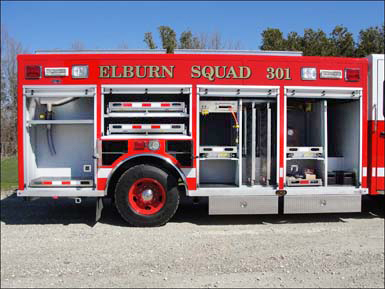 Alexis Fire Equipment has delivered a new squad to the Elburn and Countryside FPD. A complete itemization of the unit’s specifications can be seen HERE. 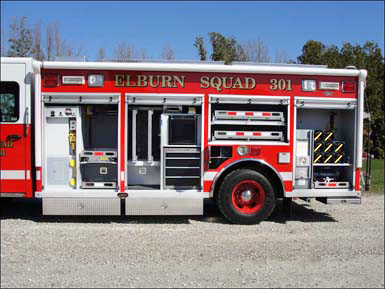 The unit has a Spartan Gladiator Classic MFD cab with a 10″ raised roof. 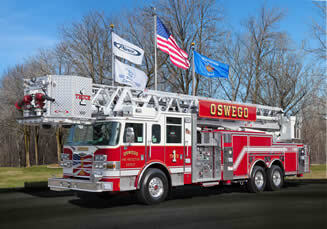 Squad 301 has a 20-foot walk-around body with roll-up doors and a Wil-Burt light tower nested on the top of the body. 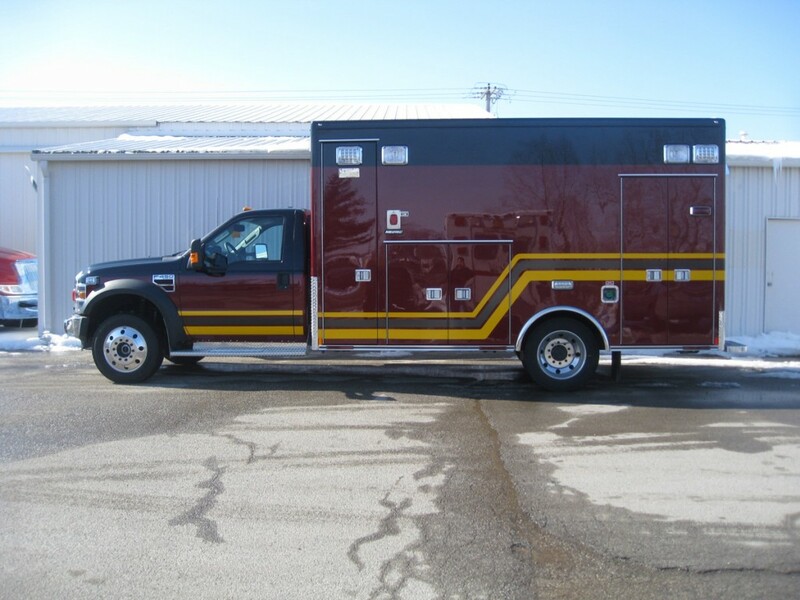 When the unit goes into service, it will replace a 1990/1985 Ford/McCoy Miller MDR. On Saturday, May 1st, 2010 the FIre Museum of Greater Chicago will open to the public. Located at 5218-20 South Western Avenue, formerly the home of Engine 123 until 1974, the museum has been the dream of a group dedicated to the preservation of the traditions and history of the fire service. You can read about the long journey HERE which the group had to take to reach this point. Chicago’s channel 7, an ABC affiliate, did a feature on the opening which can be viewed HERE. 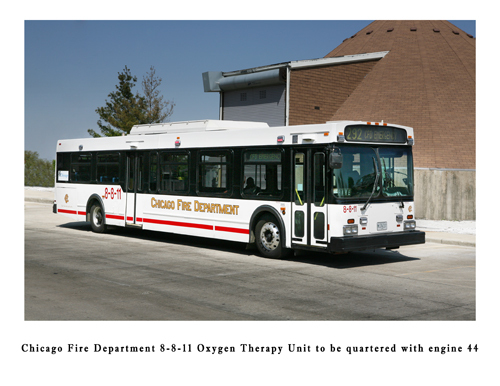 The Chicago Fire Department has put the first of a reported three Oxygen Therapy Units into service. 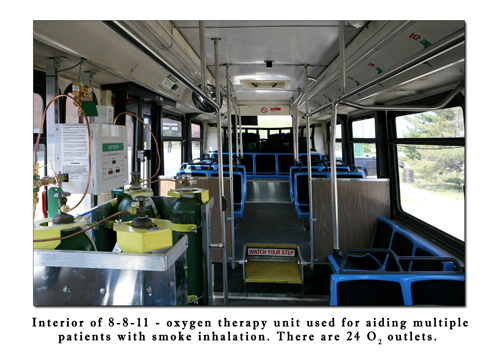 Quartered with Engine 44, the first unit 8-8-11 is a converted mass transit bus with on-board oxygen canisters which feed upwards of 24 O2 recepticles. The buses will be used to treat multple patients with smoke inhalation. Future units may be quartered with Engines 88 and 117. Deputy Chief Drew Smith from The Prospect Heights FPD submitted the folowing information. Repair all body damage and corrosion. Replace lower rub rail. Repaint required areas. Remove all worn interior plastic finishes and replace with brushed aluminum. Also reupholster all seats and cover motor dog house with brushed aluminum. 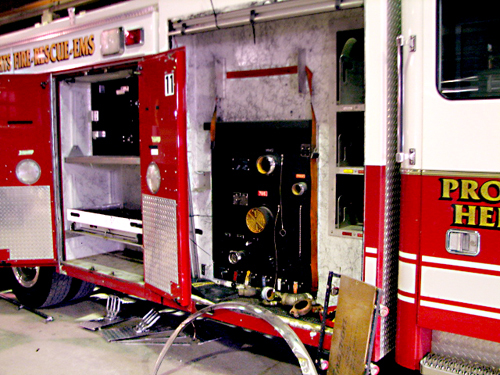 Install a Federal 2QB siren that was originally on the former 1984 E-ONE Squad 9. The existing electronic 2QB will remain. 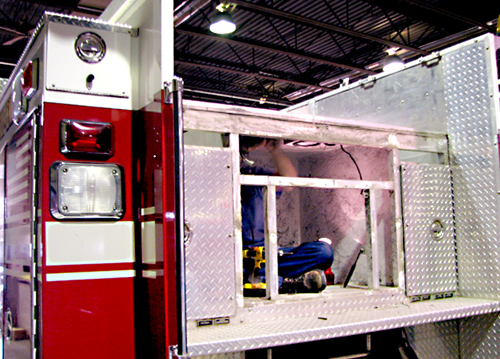 Reconfigure the rear of the apparatus to install a hose tray for 2 ½” hose bed. This will locate the main lead-out bed to be accessible at chest height when standing on the ground. Both Engine 9 and Squad 9 have this feature. The main upper hose bed will only store LDH. Perform assorted repairs to the pump and valves. 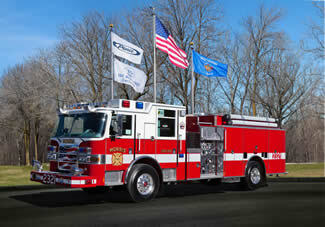 It is expected that Engine 39 will return for service by July 4th. The Mt. 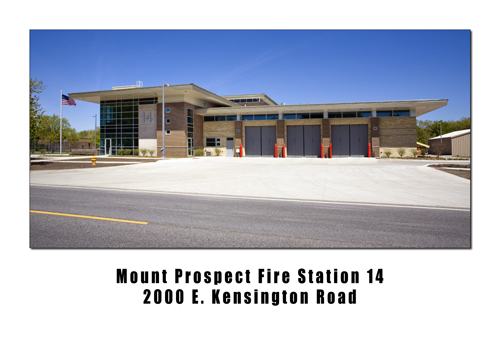 Prospect Fire Department moved into the new station 14 10 days ago although it comes as no surprise that everything hasn’t yet been completed. The contractor wasted no time in demolishing the old station next door within days of the move. 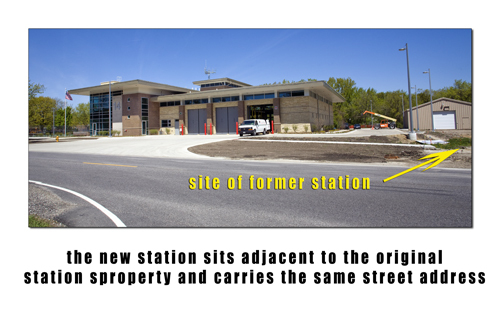 The new station shares the same address as the old station at 2000 E. Kensington. Aside from a punch list of things to do, one of the noticeable areas that needs to be completed are the front bay doors. Currently the doors are solid basic gray steel with no windows. Evidently the finish on the permanent doors has been rejected on two separate occasions. Initially they were removed to be repainted due to an ‘orange peel’ texture to the finish and when they were brought back they never made it off the truck! The permanent doors will have windows in them. An interesting note about the construction of the station is that it is built to strict standards for sustainability during severe weather. After a storm came through town several years ago and produced a significant amount of damage, it was determined that the north end of town did not have a significant structure that would provide protection to the public in the event that severe weather was imminent. The exact standards to which the building was built were not available when this post was written. So, these updated photos … will not be the last! On Valentine’s Day, an intentionally set fire resulted in the deaths of seven people in Cicero. The men charged with the crime appeared in court yesterday. Firegeezer.com, a fire service blog, has the details HERE and the Chicago Tribune has an article HERE. A gallery of images from the fire can be seen HERE.